Fishing is Captain Bouncer Smith's life. At five, he chased bluegills in Michigan; at eight he was rigging his own ballyhoo and catching sailfish on family vacations in Florida. In the 1950s, his family moved to Miami, where in his mid-teens he sold pilchards on the pier. At 18, he worked on party boats and became a licensed captain in 1968. For a few years in the mid-70s he ran a flats skiff in Islamorada, then headed north to Fort Lauderdale where he’s credited with popularizing kite fishing in local waters and was an early proponent of downriggers. In 1978 Smith returned to Miami – his 25-foot Dusky the only mid-sized charter operation advertised in three counties – where he became leading pioneer in the development of light-tackle angling. 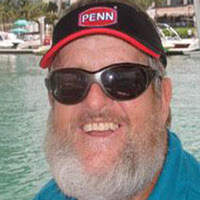 Smith's experience and knowledge of sport fishing in South Florida and beyond is not limited to one species, or one technique, or one area. He has devoted his life to sharing his passion and respect for the sport through radio and television shows, magazine articles, videos and seminars. And he’s committed to the sport fishing community -- always available to answer a question or give advice and always ready to help when non-profits and charitable organizations come calling. Smith is an advocate for marine conservation and responsible fishing practices, and he became a strong supporter of circle hooks in the 1990s after hearing Tim Choate and Ron Hamlin promote their use. Smith has led dozens of anglers -- and himself – to world records. And he’s received many impressive awards -- including The MET’s Hyman Trophy and numerous Top Guide and Captain honors -- all of which speak to his high standards and sportsmanship.